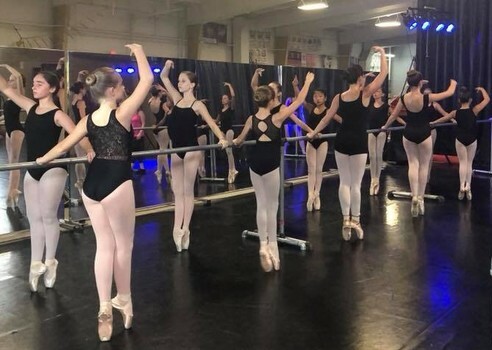 HICKORY — It’s not too early to be thinking about summertime activities for the kids as Hickory Ballet & Performing Arts gets set to roll out its summer program. Featuring creative camps, dance classes, musical theatre offerings and acting intensives for children of all ages, the multi-week schedule begins the week of June 17 and continues into early August. Four and five year olds have six camps to choose from, including Bugs & Butterflies, Mother Goose, Ballerina, Fancy Nancy, Dr. Seuss and Under the Sea. Camps run from 9 a.m. to noon. Sixth through 12th graders can choose from Intermediate/Advanced Ballet Intensives, Youth Musical Theater, Acting Intensives, and Student Choreography. Programs run from 9 a.m. to 4 p.m.
A collaboration between HBPA and Hickory Community Theater for students ages 10-17. The acting camps will provide drama instruction, including scene work and character development. Two sessions: July 22-26 and August 5-9. Each session concludes with a final rendering at 5:30 p.m. on Friday in the Firemen’s Kitchen at HCT. Open Dance Classes for ages 8 and up will be offered Monday, Tuesday and Wednesday, June 17-August 2 (closed week of July 4th) in Classical Ballet, Lyrical/Acro and Tap/Rhythm. Sessions are available for Beginner/Intermediate and Intermediate/Advanced students. In addition, private lessons are available for vocal coaching and dance instruction. To learn more about the summer activities program or to enroll, visit the HBPA website at www.hickoryballetpa.com, call (828) 328-3794, or email info@hickoryballetpa.com. HICKORY — Registration for the 2018-2019 season at Hickory Ballet & Performing Arts is now open. This year, all students in the ballet program will also participate in performances of the beloved Nutcracker ballet, December 14-16, at The Old Post Office Playhouse in Newton. Dozens of classes in a variety of dance disciplines and levels are designed to appeal to students of all ages, both youngsters and adults. Students may choose from Pre-ballet, Ballet, Broadway Rep, Gymnast Ballet, Freshman Tap, Modern Fundamentals, Men’s Ballet, Pas de Deux, Ballet Pointe and many more. Additionally, the studio offers classes in Stage Presence, Yoga, Pilates, and Musical Theatre. Classes are held Monday through Saturday. HB&PA is excited to introduce Kevin Martin, its new Resident Master Class Instructor. Kevin, an expert in Vagonova technique, will teach Advanced Intermediate-Pre Professional dance every Saturday morning from 10 to noon. Dancers from any studio are welcome to attend this class. Adrienne Lowman, an eight-year veteran of the studio, has assumed the role of full time Artistic Director of Ballet and Educational Outreach. Adrienne has taught at each level of the school and draws on her extensive experience as both a dancer and choreographer to share her passion for dance with her students. A full schedule of classes can be found on the HB&PA website at www.hickoryballetpa.com or call (828) 328-3794 to register or for additional information. Partial scholarships are available every semester to a limited number of students. The studios are located inside Foothills Gymnastics, 920 29th Ave NE, Hickory. Dance encourages socialization and teamwork. Dance instills great habits and accountability. Dance promotes an active lifestyle. Dance decreases anxiety and improves mood. Dance develops an appreciation for the arts. Ready to dance? Hickory Ballet & Performing Arts is now enrolling ages 3+ for fall! We offer a pre-professional ballet program alongside a strong performing arts program. Our classes are taught by highly trained instructors in a positive and encouraging environment. HBPA Open House: Friday, August 24th, 2018 from 5pm-9pm & Saturday, August 25th, 2018 from 9am-12noon. Hickory Ballet and Performing Arts invites you to come to our Open House! Meet some of our instructors, tour our studios and ask questions about enrollment. HBPA offers classes for children ages 3+ in ballet, tap, modern, lyrical, acro and musical theater. We also offer adult ballet, pilates and yoga! Free Trial Week: August 27th -31st, 2018. Students may try any of HBPA’s classes for free during this week with no obligation. Please call the office to sign up for a free trial class or two! Find out what type of dance your child likes best! HBPA Fall Session: Fall classes begin August 27th, 2018. Enroll today and start garnering the many benefits a dance education offers. Check out our website at hickoryballetpa.com for our fall schedule or like us on Facebook. Call 828-328-3794 or email info@hickoryballetpa.com for more information!